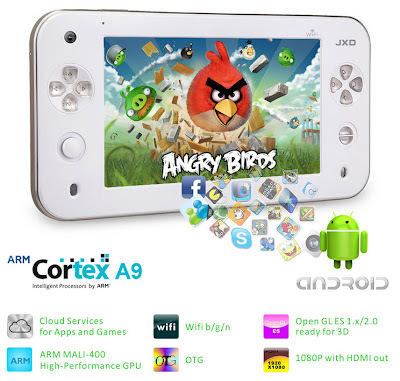 The S7100 is a combination of the features of a Tablet and a Gaming Console. It looks like a Nintendo loaded with Android. It has a hard keys that pulls the features of a Gaming console and the screen is a 7" 800x480 Capacitive Touchscreen which allows touch inputs. The entire device runs on Google's Android 2.2 (Froyo). It supports internet surfing through the WiFi and many other Office applications which come loaded in it. The HDMI port allows 1080p external display. You can connect it to a big screen and enjoy a big screen play. It also has a v2.0 USB and a 3.5 mm audio output. The device is powered by an ARM cortex A9 and aided by a 512 MB DDR2 Ram. The company's official website shows a variety of games which includes certain games including Fruit Ninja HD, Super Mario, Angry Birds, Plants vs Zombies, and lots more.